Imagine a national park filled with grassy plains, tranquil creeks flowing through lush forest, and giant rocky arches and cliffs – don’t just dream about it, find it in this sandstone sanctuary, Carnarvon Gorge. 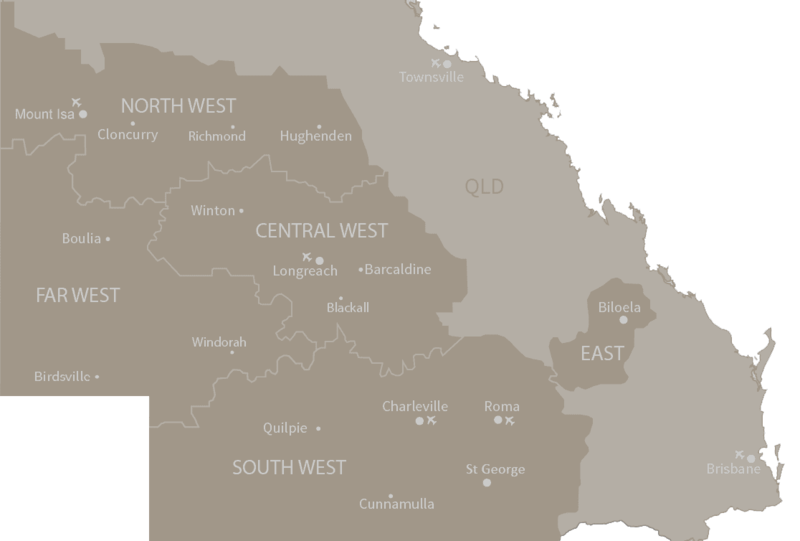 It’s hidden away in the Central Highlands (inland from Rockhampton) where the bustling country towns make way for mountain ranges, rocky escarpments and deep gorges. 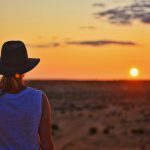 If you’re keen on experiencing Carnarvon Gorge minus the swag and hiking backpack, put your feet up at Wallaroo Outback Retreat. 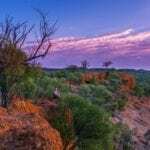 This five-star retreat is nestled amongst 71,000 acres of outback landscape – with panoramic views of the Carnarvon Ranges so you feel connected to the sandstone beauty while you recline in a hammock and sip on a cuppa. The private retreat can be hired exclusively – with glamping safari tents housing a maximum of 16 people. It’s a self-catered affair, with only the tents, lodge hall for activities, and an amenities hall available. Spend a day venturing out to the gorge, with an easy one hour drive north to the start of short walking tracks, meaning you can get back to your afternoon cuppa without rushing back through the bush. Psst – want this luxury experience with a bit more adventure? Be sure to check out number four. Get the best of both worlds with a stay at Sandstone Park, which offers 360 degree panoramic views of the gorge and easy access into the thick of it. This one is for those who aren’t about adventuring 24/7 – nestled on the base of the national park, this camping and caravanning oasis lets you appreciate its beauty from afar while you take a rest from exploring. A quick five minute drive takes you from scenic views to self-guided adventure, however it you’d prefer not to go it alone, there are guided tours and even helicopter rides available from Sandstone Park. Don’t want to leave the pooch behind? Sandstone Park is pet-friendly, so all members of the family can enjoy the holiday. No matter your preferred accommodation style – TakaRakka Bush Resort has got you covered. From self-contained studios, cottages and cabins to glamping safari tents and standard caravanning and camping sites, you can map out your very own Carnarvon Gorge adventure between $36 and $215 per night. Translating to “peace and tranquillity”, guests are encouraged to find their own Taka Time amongst the untamed wilderness of the both the national park and the property (pssst – spend some time down at the resort’s Carnarvon Creek and you might be lucky to spot a platypus). Explore the gorge by day, ease into the night with a drink at the Bush Bar, and unwind under the starry sky with a roasted marshmallow or two around the campfire. Ahh the serenity. Discover the hidden world of Carnarvon Gorge with a Wonders of Wallaroo adventure with Boobook Eco Tours. 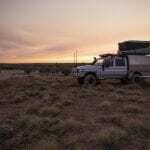 Departing from the Roma, the four-day three-night eco tour takes you to the Wallaroo Outback Retreat – merging the relaxing five-star retreat with adventure. Here you can participate in daily guided group treks through the national park, experience everyday life on the farm, and kick back and enjoy the country hospitality. Stay in the safari-styled tents where you can wake up to birds, fresh air, and spectacular views of Carnarvon. If camping in the middle of nowhere with nothing but a swag and canned food isn’t your cup of billy – then settle in at this resort-style accommodation. With a swimming pool, licenced restaurant, discovery centre, and cabins – the Carnarvon Gorge Wilderness Lodge allows you to stay amongst the wilderness, without sacrificing creature comforts. Just a short 3km from the lodge is the starting point for most of the national park’s walks, which take off from the Park Headquarters. Here you can grab a map, learn about what flora and fauna you’ll encounter, and plan your route to the different lookouts, swimming spots, and gorge walks. Keen to explore the wider Carnarvon Gorge area? 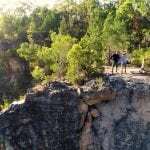 Have you been to Carnarvon Gorge? Where did you stay?